The ceramic dielectrics are made of a variety of titanates, zirconates, and oxides (and many other things as well). Common ingredients include titanium dioxide, barium titanate, and strontium titanate. The exact formulas for the various ceramics differ from one manufacturer to another. The EIA classifies the ceramics into four classes (1-4), and into types within those classes. The lower the class number, the better the overall characteristics, but the larger the size for a given capacitance. Types within each class define recommended temperature range, temperature drift, and tolerance on the expected temperature drift. Other parameters are less well defined. However, the EIA does provide guidelines as to how they will be measured. These include insulation resistance, dissipation factor, quality factor, voltage dependence, and a host of environmental tests, such as thermal shock, moisture resistance, and flammability. Generalizations about critical parameters can usually be made about the various types with good reliability, even when not stated. In some cases however, you will have to look to the manufacturer for data. Class 1 ceramics include C0G (often called NP0), and temperature compensating capacitors. They are based titanium dioxide but can have low levels of barium titanate, calcium titanate, and other things added to increase the dielectric constant, or to get a desired temperature slope. C0G capacitors have many of the advantages of film capacitors plus very low temperature drift (limited to ±30 ppm/C over 25-85C), including very low aging, voltage coefficient, frequency coefficient, leakage, and dissipation factor. C0G capacitors are used into the GHz range. Dielectric absorption is typically "low" but not usually specified. It is reported to be relatively variable from part to part and lot to lot. Also, manufacturers give conflicting numbers. About the only problem with C0G capacitors is size. Although the dielectric constants of Class 1 ceramics are higher than for plastics films, the voltage breakdown is lower. At values of about 0.01 µF and below, this is not a great problem because packaging is usually the dominant factor in size, but above 0.01 uF, C0G caps get rather large. Except for special multi-chip packages, 0.047 uF is about the largest through-hole you will see and 0.027 uF is about the largest chip SMD. Multi-chip SMD parts go much higher however. For reasonable sizes, the cost difference between C0G and lesser ceramic capacitors is small. For most analog applications, use C0G capacitors whether you think you need them or not. The behavior of lower-grade ceramic capacitors can be so strange that you never know when some parameter idiosyncrasy will sneak up and bite you. Temperature compensating capacitors are available in the range of at least P1000 through N5600 (+1000 ppm/C through -5600 ppm/C). Tolerance on the temperature slope can vary from 30 ppm/°C for the lower slopes (N30 through N220) up to 1000 ppm/°C for N5600, however. Above N4200, their properties start to look more like Class 2 than Class 1. Both dissipation factor (DF) and dielectric constant (K) go up as the temperature slope of Class 1 ceramics goes more negative, thanks to the additives. Because of this, manufacturers seeking a specific compromise among DF, temperature drift, and size will sometimes use temperature compensating dielectrics when no temperature compensation is desired. For example, use a N1000 where C0G would be preferred, but size does not allow. They may also brew up proprietary dielectrics that don't exactly fit any of the EIA styles. Pseudo C0Gs are available, if rarely, with rated temperature drifts as low as +-10 ppm. Table 1 shows EIA codes for Class 1 ceramic capacitors and specifies temperature range and capacitance drift tolerance over that range. Table 1 EIA Codes For Temperature Slope of Class 1 Ceramic Capacitors. So, for example, the ever popular C0G has a temperature drift of 0.0±30 ppm/C (+25C to +85C) and P3K has a temperature drift of -1500 ± 250 ppm/C. Tolerance only applies from +25C to +85C. From +25C to -55C the "-" figure is 1.25-4 times higher depending on the "Significant Figure". For example, C0G is ±30 ppm/C from 25C through 85C, but +30/-75 from 25 to -55C. Don't expect to see all possible combinations. Who would want a C0N for example? The EIA has a "preferred" list of some 200 parts, but only about two dozen are commonly available. Industry commonly uses an "N/P" designation system that is obsolete, but is more intuitive, and more reflective of what is actually in production. The "N" is used for capacitors with a negative temperature coefficient, and a "P" for those with a positive coefficient. Manufacturers usually use both in their catalogs, while distributors' catalogs often use only the N/P codes. Purists righteously disdain the use of NP0 (an older industry designation) when referring to C0G (an EIA specification) capacitors, however. Table 2 Some Commonly Available Class 1 Capacitors With Both EIA and Industry Codes. Class 2, 3, and 4. Class 2 and higher ceramics are typically based mostly on barium titanate (Ba2 TiO3), although other materials are apparently coming into use. They have problems not seen in Class 1 and film capacitors, including very poor temperature drift, high voltage-coefficient-of-capacitance and, high voltage-coefficient-of-dissipation factor (all of these are different for AC and DC), high frequency-coefficient-of-capacitance and a significant aging rate. The higher K material, > X7R were once considered to be too unreliable to be used in critical applications, but quality is much better today. These capacitors age because the crystal structure they have when they are made slowly changes to another, lower K form, over time. The crystal structure can be be changed back by heating for several hours at 125C to 150C, after which the aging starts all over again. Applied voltage affects some properties so much that these capacitors are normally characterized at no more than 1 volt AC or DC. Because these affects are all more dependent on applied voltage vs. maximum voltage (volts per thickness in other words) than on the absolute voltage, you can try using the highest voltage part possible, size permitting. The table below shows what happens to capacitance when DC voltage is applied to various ceramics. Capacitance vs. AC voltage, and D. F. vs. both DC and AC voltage go through more-or-less similar contortions. The numbers are approximate at best. They will vary considerably with the actual rated voltage, and with manufacturer. Table 3 shows EIA codes for non-temperature-stable ceramic capacitors and specifies temperature range and capacitance drift tolerance over that range. So, for example, an X7R would be usable from -55 through +125C and should change no more than 15% from its 25C value. One note, however; Class 2 and higher capacitors are affected by voltage and the above drift limits hold only at low applied voltage. Don't expect to find all possible combinations; X7R, Z5U, and Y5V are the most common although other types are also seen. Why use them if their electrical properties are inferior to C0G? Size and cost. You will rarely see C0G larger than 0.047 uF (at least as a standard product), but Z5U can be found as large as 22 uF, even in SMD. Poor as it is by C0G standards, a 22 uF Z5U can compete with the equivalent electrolytic in many high-frequency applications with a much lower ESR. As switching power supplies go ever higher in frequency, large ceramic capacitors look more and more attractive compared to higher ESR electrolytics, and some manufacturers make parts, both SMD and leaded, aimed directly at that market . On the other hand, advances in film production have allowed large low-voltage film capacitors to compete with ceramics in some applications. Some manufactures offer films as ceramic substitutes without even mentioning the dielectric, although it is almost certainly polyester. As a rule of thumb, Class 1 ceramics (like C0G) can be used in many common analog electronics applications. 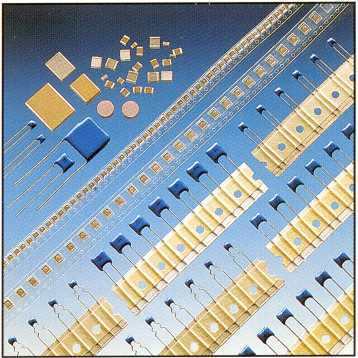 Exceptions would be sample-and-hold circuits and integrators, where mediocre dielectric absorption may be a problem. Class 2 ceramics (like X7R) are best suited for coupling (DC blocking) and power supply bypassing. X7Rs can be used in some linear applications with care where performance and stability are of no great concern. It would probably be best to use the highest voltage rating practical to minimize leakage, which can vary a lot from part to part. Class 3 capacitors should be used only for DC blocking and P.S. bypassing, and even then, change in capacitance due to aging, temperature coefficient, and voltage coefficient must be taken into account. For the best characteristics from Class 2 and 3 ceramics, use the lowest K material that you can, and use them at a low percentage of rated voltage. Class 4 are the barrier-layer or reduced-titanate ceramics. They may not have quite disappeared, but close to it. These ceramics have low breakdown voltage, high leakage and all-around terrible electrical properties. High Ks made them useful at one time but modern multilayer ceramics have largely made them obsolete. 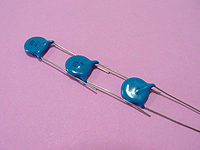 The construction of ceramic capacitors have changed dramatically over the last few decades. At one time, a common form was that of a single-layer ceramic disk. A metal layer was screened and fired on each side, and wires soldered on. This was fine for making 1000 volt/0.01 uF capacitors, but with the decline of the vacuum tube, demand for such parts has likewise declined. There is still a place for them, but not inside a cell phone or laptop computer. Today's electronics requires ever more capacitance in a smaller volume. The way to get it is with the "multilayer ceramic capacitor" (MLCC). MLCCs are made by screening many very thin alternating layers of unfired ceramic and silver-palladium alloy electrodes, and firing the result to make a finished capacitor. The dielectric layers may be >30 microns to <5 microns. SMD ceramics are made in astonishing numbers, 100 billion/year is one number I have seen. The end electrodes are usually tin-lead over nickel, but other systems are occasionally used, such as silver-palladium over nickel or gold over nickel. Silver-palladium is used where the parts are glued with silver-epoxy instead of being soldered (rare). Silver-palladium is almost impossible to solder. The internal electrodes are usually silver-palladium, but other metals are also used; nickel electrodes may to be the wave of the future with the metal´s lower resistance and lower cost. The cost of palladium has been increasing dramatically. At least one manufacturer, Taiyo Yuden, has MLCCs with nickel electrodes already on the market, with other major vendors (Murata, Vishay, Kemet) expected to follow shortly. Nickel-electrode MLCCs are an unknown quantity as regards to reliability however, and customers can be expected to be suspicious until they have proven themselves. Some manufacturors are trying to reduce costs by reducing the ratio of palladium to silver (silver being the cheaper of the two metals). The thinner the ceramic, the better. If you halve the thickness, the capacitance-per-volume (volumetric efficiency) quadruples. The limiting factor is voltage breakdown. However, thinner also means more difficult to make reliably. At present, manufacturers are making MLCCs with up to 100-1000 ceramic layers with a thickness that may approach as little as 1 micron depending on voltage rating. MLCCs with more and thinner layers are promised, the goal being to make the layers so thin they are no thicker than needed for the system supply voltage. This may have happened by the time you read this. MLCCs are available as leaded devices, both as disks and as chip capacitors with leads, but SMD is where the real action is. Low ESR. This can be done in a number of ways. Some are wider than they are long; some use nickel electrodes. Low height, for use in things like smart cards, or to go under a RAM IC for power supply bypassing. High temperature operation, to at least 200C in NP0 and X7R. High voltage, to at least 10 kV in SMD. Multiple chip assemblies with lead frames. 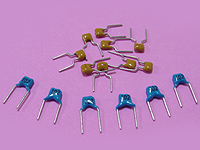 A number of end electrodes metals, both for soldering and gluing (conductive epoxy). A variety of special sizes and shapes for applications like very high current RF, or microwave use. And not to be forgotten: ROHS (pronounced "rose").